Today’s topic is often referred to as irregular. Irregularly irregular. That is right, we are discussing atrial fibrillation today. Atrial fibrillation is a cardiac arrhythmia caused by irregular atrial electrical activation often leading to a quickened ventricular response. One of the significant concerns with atrial fibrillation is when the atria quiver, blood pools in the upper chambers of the heart, which increases the risk of clot formation. Atrial fibrillation has been seen to increase the risk of cerebrovascular accident (stroke) by five times. Additionally, atrial fibrillation worsens cases of heart failure and increases patient mortality with myocardial infarction history. This disease is ubiquitous, especially as our population ages, so it is something that you will undoubtedly see as a student, as well as a practicing clinician. Am Fam Physician. 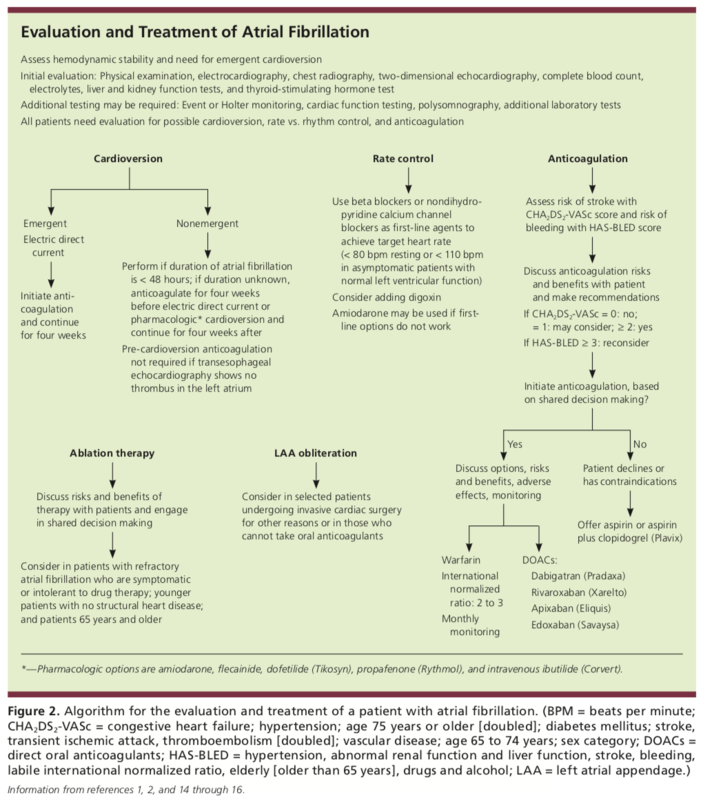 Diagnosis and Treatment of Atrial Fibrillation. 2016;94(6):442-452. Copyright © 2016 American Academy of Family Physicians. There are several types of atrial fibrillation. The most common being nonvalvular atrial fibrillation, which occurs in the absence of a mechanical or prosthetic valve, rheumatic heart disease, or mitral valve abnormalities. Paroxysmal atrial fibrillation is intermittent and resolves spontaneously within seven days of beginning. Paroxysmal and permanent forms of atrial fibrillation carry the same long-term risk of cerebrovascular accident. If the abnormal rhythm lasts longer than seven days, the likelihood of atrial remodeling increases, which leads to the risk of the rhythm being maintained long term. The last type of atrial fibrillation is caused by valvular disease (valvular atrial fibrillation), and this type carries a higher risk of stroke than nonvalvular atrial fibrillation. A noncardiac etiology can also cause atrial fibrillation, in which in these cases, treating the etiology often will fix the arrhythmia. 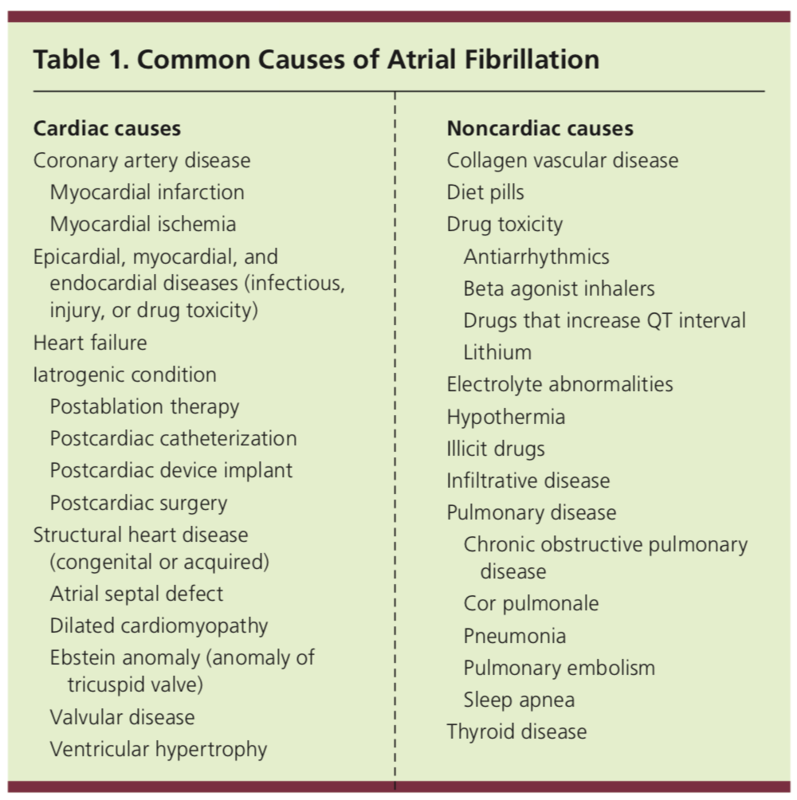 Causes of atrial fibrillation are listed as below. Patients that present with atrial fibrillation may be completely asymptomatic, or they may be at the entire opposite end of the spectrum in the midst of acute heart failure exacerbation, myocardial infarction, stroke, or hemodynamic instability. Common symptoms that a patient may present with in cases of atrial fibrillation include dyspnea, orthopnea, fatigue, dizziness, palpitations, syncope, or chest pain. When taking the history, it is essential to assess for any baseline thyroid disease, sleep apnea, recent illness, new medications or supplements, illicit drug, alcohol, or diet pill use. Physical examination should assess the patient’s vital signs including pulse, blood pressure, pulse oxygenation, and respiratory rate. One should assess for any heart murmurs, evidence of heart failure with peripheral edema, rales, S3 gallop, jugular venous distention, and the peripheral pulses. Just as briefly mentioned above, the diagnosis should be confirmed with a 12 lead EKG. However, if the EKG is normal, this does not entirely rule atrial fibrillation out, due to the chance that the rhythm is paroxysmal and the EKG may not catch the abnormal rhythm at the time that it is completed. If suspicion is high with normal initial EKG results, a Holter monitor (24 to 48 hours) or event recorder (7 to 30-day recording) should be completed. Initial laboratory workup may include a complete blood count, thyroid stimulating hormone, and comprehensive metabolic panel. If the diagnosis of atrial fibrillation is confirmed at this point with the EKG, then all patients must have an echocardiogram to assess cardiac function and structure. Additionally, a chest radiograph should be completed to assess for any lung related disease or pathology. Additionally, with a patient who presents with new onset atrial fibrillation, we as clinicians and students should ask ourselves why is this occurring? The mnemonic PIRATES aids us with possible underlying etiologies that may be a contributing factor to the atrial fibrillation. Depending on the patient and their history and risk factors, a patient may need a stress echocardiogram or nuclear stress test, or cardiac catheterization to assess for ischemic etiology. If sleep apnea is suspected, then an overnight sleep study can be considered. In patients who are unstable hemodynamically, prompt evaluation and treatment are required including emergent cardioversion, if necessary.1 In stable patients, treatment depends on the length of time that the arrhythmia has been present and if there is any underlying cardiac disease. Regarding treatment, three issues must be addressed in these patients. How to best control the rate of the ventricles, determining if a procedure to convert the rhythm back to normal sinus is safe and advisable, and does anticoagulation need to be started, and if so, which one. The figure below summarizes guidelines on how to address each of these topics. Rate control is an important portion of the management of atrial fibrillation in both acute and chronic cases. By slowing down the rate, improvement of ventricular filling, reducing cardiac oxygen demand, and improving coronary perfusion is achieved. Given the challenges and adverse effects of many of the antiarrhythmic medications, most patients with atrial fibrillation are treated with rate control as opposed to rhythm control. Beta-blockers (Ex. metoprolol) or nondihydropyridine calcium channel blockers (diltiazem or verapamil) are often used to control a patient’s heart rate. Rate control should have a goal of less than 110 bpm resting in most patients; however, less than 80 bpm may be needed in some patient to resolve symptoms. Non-cardioselective beta blockers are contraindicated in those with signs of acute heart failure, severe COPD, or asthma. Cardioversion is indicated in unstable patients or those who have poorly tolerated symptoms that are unresponsive to typical medical therapies. Unless this procedure is done emergently, or if the duration of arrhythmia is known to be less than 48 hours, four weeks of pre and post cardioversion anticoagulation is needed. Cardioversion can be completed electrically or medically. Electrical cardioversion is usually successful in the short term, but often not for the long-term.1 Electrical cardioversion provides a direct current shock timed with the QRS complex to avoid precipitating ventricular fibrillation. Typically, one or more shocks of 200 to 300 joules are used. Medical cardioversion uses intravenous amiodarone, ibutilide, propafenone, flecainide, or dofetilide. Medical cardioversion can be difficult due to the limited long-term effects of antiarrhythmic medications, as well as the risk of triggering a life-threatening arrhythmia. In general, medical cardioversion has been found to be more successful in those under 65 years of age without any cardiac structure abnormalities. Contraindications to either form of cardioversion include atrial thrombus presence, multifocal atrial tachycardia, digitalis toxicity, and non-optimal anticoagulation. Radiofrequency ablation is a nonoperative, catheter-based procedure used to locate and destroy abnormal atrial foci that are responsible for the atrial fibrillation. Specific areas that have been identified as problematic in these cases have been found to be at or near the pulmonary vein opening into the left atrium. Some studies have shown that ablation is more effective than antiarrhythmic medications in patients with paroxysmal atrial fibrillation. However, long-term data on the safety of radiofrequency ablation is limited, and atrial fibrillation may return after the procedure in 20 percent of cases. Anticoagulation is a central portion of the medical management of atrial fibrillation. Anticoagulation drastically reduces the risk of embolic stroke in patients with atrial fibrillation, but it also increases the risk of bleeding. In most cases the benefit of anticoagulation outweighs the risk of bleeding; however, this should be discussed with all patients prior to initiating therapy. 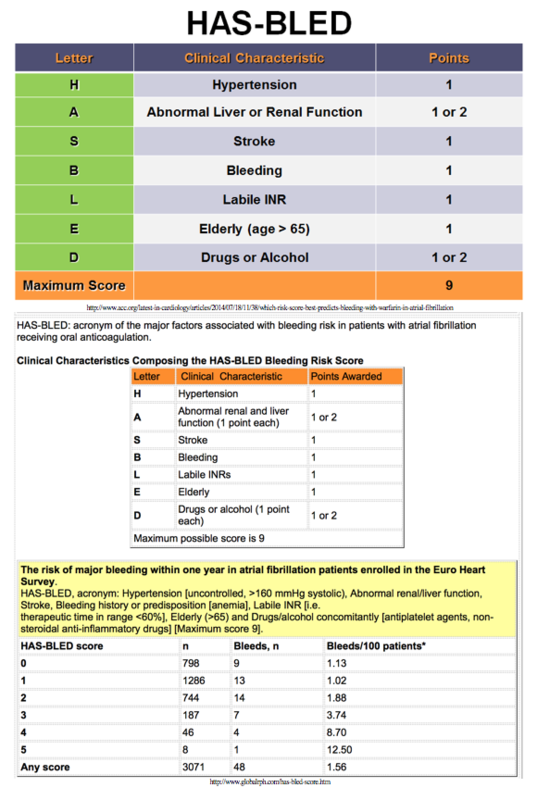 To aid in the assessment of the risk of stroke without anticoagulation versus the risk of bleeding if on anticoagulation, tools/calculators are used called the CHA2DS2-VASc and the HAS-BLED scores. 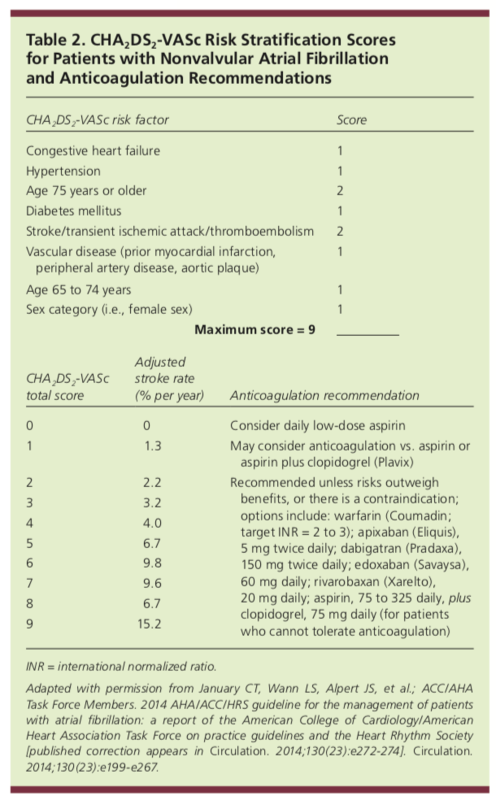 These are recommended by the American College of Cardiology to be used to assess the risk versus benefit of anticoagulation. 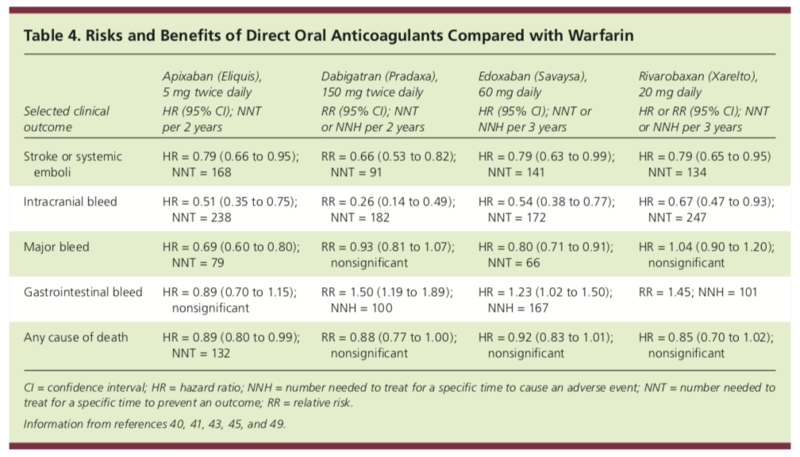 Regarding options for anticoagulation, warfarin lowers the risk of thrombus formation, but has a narrow therapeutic range, several food and drug to drug interactions, and requires regular INR monitoring. With that said, warfarin is used first line in patients who have valvular AFIB (prosthetic heart valves, rheumatic mitral valve disease, and mitral stenosis). Direct oral anticoagulants including direct thrombin and factor Xa inhibitors (DOACs) can be used for anticoagulation. The significant advantage with these medications is that there is no food and fewer drug to drug interactions, fixed dosing, and no need for INR monitoring. The drawback is cost primarily as these medications can be quite expensive. A past hindrance was the lack of a reversal agent; however, the novel AndexXa provides a reliable option for reversal in emergent cases. Dabigatran has been shown to be as effective as warfarin with a reduced rate of intracranial bleeds, but an increased risk of gastrointestinal bleeds in comparison. Factor Xa inhibitors rivaroxaban, apixaban, and edoxaban are available for anticoagulation in patients with nonvalvular atrial fibrillation. Rivaroxaban and apixaban have been shown to be noninferior in regards to thrombus formation to warfarin, and apixaban has been shown to have a higher rate of stroke prevention in comparison to warfarin. NHS Wiltshire Clinical Commissioning Group. 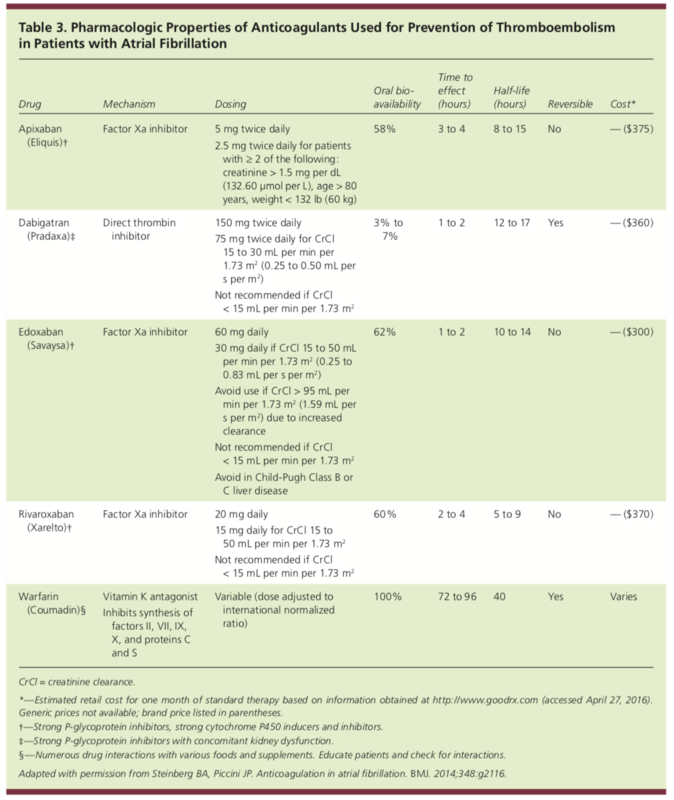 Guidance on Converting Between Anticoagulants. Am Fam Physician. 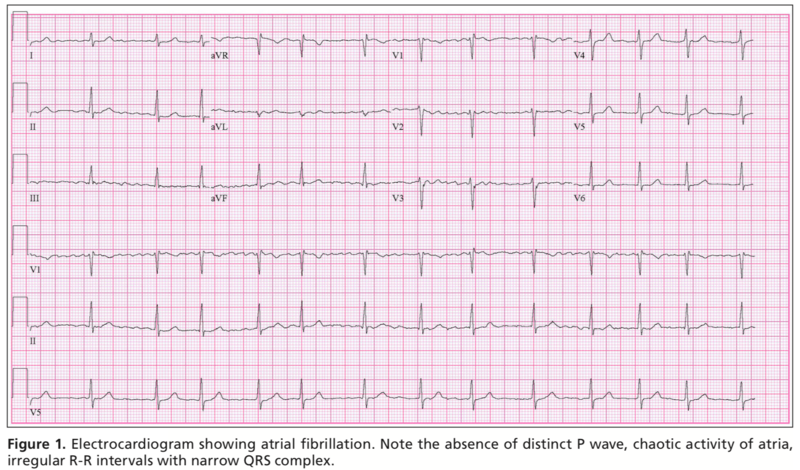 Newly Detected Atrial Fibrillation: AAFP Updates Guidelines on Pharmacologic Management. 2017. UpToDate, Apixaban: Drug Information. Accessed: July 4, 2018. NHS Wiltshire Clinical Commissioning Group. 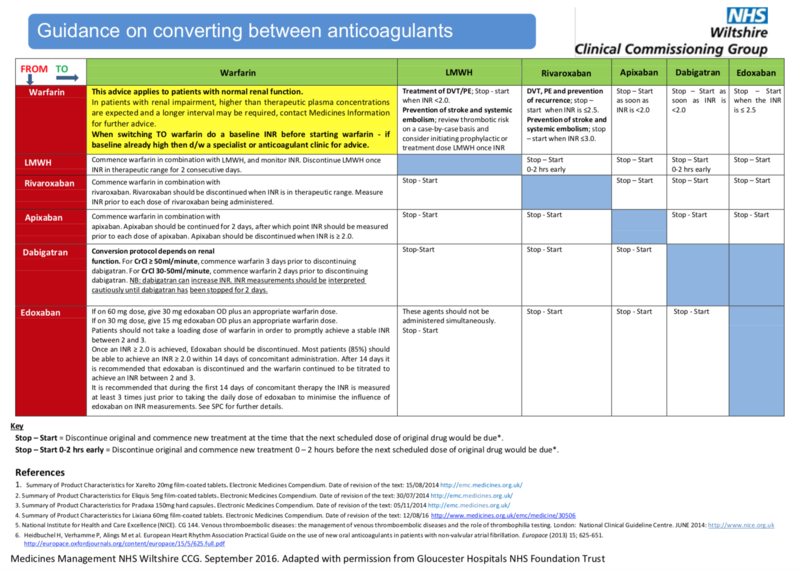 Guidance on Converting Between Anticoagulants. Accessed: July 4, 2018. This article, blog, or podcast should not be used in any legal capacity whatsoever, including but not limited to establishing standard of care in a legal sense or as a basis of expert witness testimony. No guarantee is given regarding the accuracy of any statements or opinions made on the podcast or blog.